Peeps are so cute that I tend to enjoy them even after Easter. I bought an adorable Peeps bunny cookie pan from Candyland Crafts in Somerville (if you live in Jersey, you must go visit them!) but then I got sick right around Easter time and I never had the chance to use it. Never one to let a good, adorable cookie pan go to waste, I made a Spring bunny cookie for myself The Jersey Momma's Boy after the holiday. 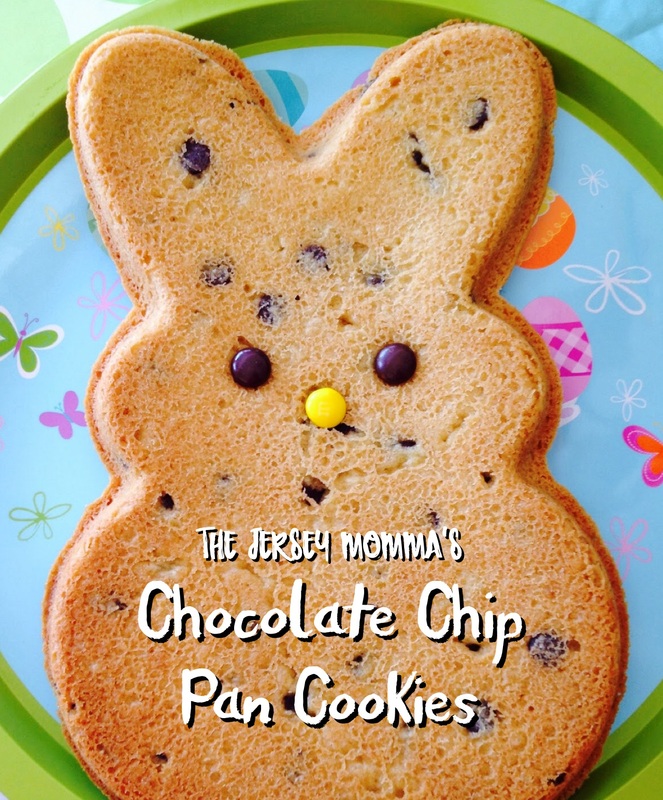 Don't forget, you can Pin this recipe for later and make a giant cookie any old time you want! This is one of my favorite cookies to make because it's so easy and it's fun to cut chunks out of it while it's still warm. Just be forewarned that if you over-bake it, it turns out more like a Blondie (more cake-like). So if you prefer your cookies to be cookie-ish, be sure to take it out of the oven as soon as it begins to brown. 1. Spray your pan well with cooking spray. Preheat oven to 350 degrees. 2. In a large bowl, combine butter and sugars. Beat with an electric mixer until light and fluffy. 3. Add egg and vanilla, mix well. Stir in flour, baking soda and salt. The dough will be really dry- just keep mixing carefully until it forms a soft dough. 5. Pat dough into your pan (you can grease your hands with cooking spray or oil if needed). Press almost to edges. 6. Bake 15-20 minutes or until light golden brown. 7. Cool on rack for five minutes, then gently flip cookie upside down to remove from pan. You can place a cooling rack on top of the cookie before you flip the pan over so that the rack catches it easily. Then transfer to a plate. Let cool completely. You can decorate the cookie with decorator frosting, or M&M's if the cookie is still warm. Serve with ice cream, if desired! We opted to put the eyes and nose on the flat side of the cookie, but you might choose to flip it over and decorate the "bumpy" side, too. As I said earlier, this cookie comes out tasting a lot like a blondie (meaning it's a little more cake-like with a soft texture, with the flavor of a blondie), especially if you over-bake it. It is not overly sweet or chocolatey (but it CAN be if you add extra chips!). This recipe should work with most cookie pans. If you like-a my cookie pan, you can use my affiliate link below to find one on Amazon. Or maybe pick another! There are lots. Make one, Mary! It's really easy! We wound up making a second one! Yum! I am so doing this! You totally should, Rebecca! You don't even need a pan, just go for it! !